Joseph MOYCE (1597 – 1655) was Alex’s 11th Great Grandfather; one of 4,096 in this generation of the Miller line. 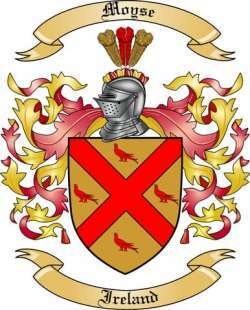 This probably isn’t Joseph Moyce’s, but Coats of Arms are my symbol for immigrant ancestor. Joseph Moyce was born in 1597 at Dennington, Suffolk, England. He married Hannah FOLCORD before 1618 in Salisbury, England. Joseph died in 1655 at Haverhill, Essex, Mass. Alternatively, he died after 1669. Hannah Folcord was born in 1601 in Dennington, Suffolk, England. 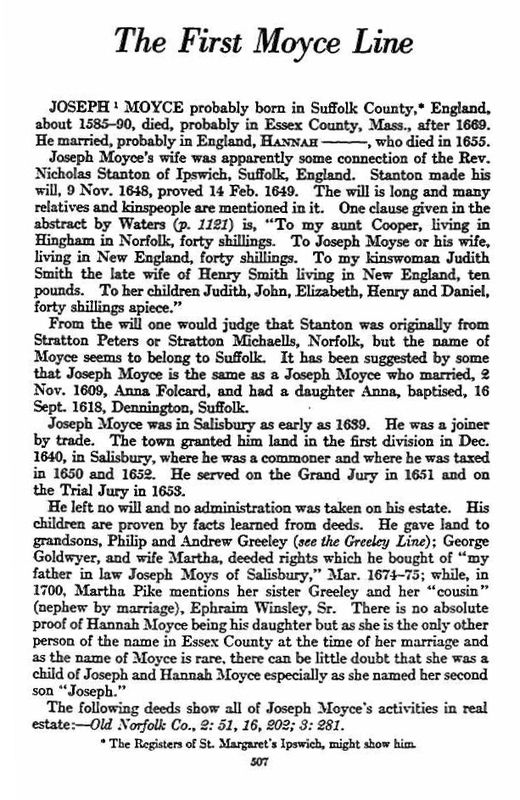 She may be related to Nicholas Stanton of Ipswich, Suffolk, England because Joseph and Hannah Moyse, living in New England were mentioned in Nicholas Stanton’s will in 1648. Alternatively, Hannah was a daughter of Nicholas Stanton. Hannah died in 1655 in Salisbury, Essex, Massachusetts. Joseph Moyce was resident in 1640 at Newbury, Mass. He lived in 1649 at Haverhill, Essex, Mass. Hannah Folcord may be related to Nicholas Stanton of Ipswich, County Suffolk, England. Joseph Moyse and his wife, living in New England were mentioned in the will of Nicholas Stanton of Ipswich, County Suffolk, England in 1648. The surname Moyce or Moyse, originally spelled Moyses, is a baptismal origin, meaning ‘the son of Moses’. Hasting Moyse of County Suffolk and William Moyse of County Essex are named in the Hundred Rolls of 1273. 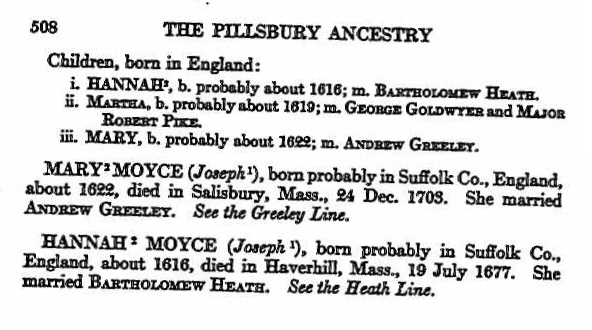 Joseph Moyce, first of his family of which record has been found, is mentioned as receiving land in Salisbury, Massachusetts in 1640 and 1641. Listed as a joiner, he appears on the list of commoners and taxpayers of 1650 and 1652 and was granted land in 1654. His name appears on a petition in 1658. Salisbury was once territory of the Pentucket tribe of Pennacook Indians. It was settled by the English in 1638 as Merrimac, after the river, and incorporated in 1639 as Salisbury, after Salisbury in Wiltshire, England. The original roads at the center of the town formed a compact semicircle, which allowed the residents to quickly reach the garrison house in case of attack. Those roads still exist, though the shape today is triangular, being bounded by Elm Street, School Street and Bridge Road. One of the two greatest fears at the time was the Naumkeag tribe of Indians, thus the men of the town took turns standing watch against a surprise attack, especially at night. The Naumkeags, however, had been decimated by plague, and the threat was not what it once might have been. The second threat came from wolves, which were plentiful, and which killed the livestock and dug in the graveyard. No will or probate records have been found for Joseph Moyce. Information on land deeds for Joseph Moyce can be found in Old Norfolk County. Martha’s first husband George Goidwyer (Goldwire) was born about 1620. George died 12 Apr 1684, Salisbury, Essex, Mass. He was of Haverhill in 1648, when he bought house and land in Salisbury of Samuel Dudley. It is said that he was of Dover in 1658, but he was of Salisbury in 1657 and ’64. Martha’s second husband Maj. Robert Pike was born 16 Mar 1615/16, Langford, Wiltshire, England. His parents were John Pike and Dorothy Day. He married first 3 Apr 1641, Salisbury, Essex, Mass. to Sarah Saunders (b. 20 Aug 1615, Weeks, Downton parish, Wiltshire, England; d. 1 Nov 1679, Salisbury, Essex, Mass.) Robert died 12 Dec 1706, Salisbury, Essex, Mass. 17 May 1637 – Admitted Freeman. Robert Pike we learn from the historian, Coffin, took great interest in Governor Winthrop’s campaign for the governorship against Sir Harry Vane, as the close of the latter’s term drew near. So Mr. Pike, with nine others including John CHENEY, Thomas COLEMAN, Henry Sewall Jr, Nicholas Noyes [Cheney’s future father-in-law], Archelaus Woodman [Edward WOODMAN‘s half-brother], Thomas Smith, James BROWNE, Nicholas Holt [future son-in-law of Humphrey BRADSTREET, and John Bartlett, .walked forty miles from Newbury to Cambridge on foot to take the “freeman’s oath” and qualify themselves to vote in the election which was soon to take place. It was by such prompt movements that Winthrop was elected and the conservative party triumphed. rep. 1648 and several years following; Assistant 1682 down to 1692; member of the Council many years down to 1696, and justice of the peace many more. He was very decided in his opinions, which were liberal in advance of his time, and had difficulties with other members of the Salisbury Church. as early as 1675 and as late as 1700. He has been called “the moral and fearless hero of New England. ;” “the first and strongest representative of the right of petition;” the “power which squelched the witchcraft delusion,” etc.? His son, Rev. John, Pike in his “Journal,” states that his father “was always very temperate in reference to meats and drinks.” In 1653 he denounced the law passed by the General Court designed to restrain Peasley and Macy of Ames. from preaching in the absence of a minister. He declared “that those members who had voted for it had violated their oaths as freemen; that their act was against the liberty of the country, both civil and ecclesiastical, and that he stood ready to make his declaration good.” For this he was tried, convicted, fined, and disfranchised, by the General Court. The punishment inflicted on Lieut. Pike caused petitions to be signed by many persons in the surrounding towns, asking that the sentence be revoked. This offended the Court still more, and the signers were called upon to give “a reason of their unjust request.” In Oct., 1654, out of the whole number of signers, about one-fifth, or fifteen persons, only, were reported “who have not given satisfaction,” and therefore insisted upon the right of petition. Robert Pike’s fine was paid, and in Oct., 1657, his disfranchisement was removed. In 1858 he was again elected to the General Court. In 1675 Robert Pike resisted the authority assumed by his pastor, Rev. John Wheelwright, and was excommunicated from the S. chh. ; but was reinstated the next year. In 1692 he appeared in the third great controversy of his life, in opposition to the witchcraft delusion. At the age of thirty-two he was chosen a member of the General Court, and had a much longer service in that capacity and as councilor and assistant, than any of his contemporaries. He had a good education and wrote a fine, flowing hand. He was an easy, eloquent and forceful speaker. He was engaged in at least three conspicuous controversies during his life. The first was his arraignment by the General Court in 1653, for his hostility to the persecution of the Quakers. The second was his resistance of the dogmatic authority of some of the clergy, in the person of his pastor, Rev. John Wheelwright. The third was his bitter opposition to the witchcraft prosecutions in 1692. In all these controversies, Robert Pike stood practically alone. He was a century in advance of his time, and a century has more than vindicated his advanced positions. The historian of the Salem witchcraft delusion says that “not a voice comes down to us of deliberate and effective hostility to the movement, except that of Robert Pike in his cool, close and powerful argumentative appeals to the judges who were trying the witchcraft cases. It stands out against the deep blackness of those proceedings like a pillar of light upon a starless Midnight sky.” Confronting the judges stood this sturdy old man, his head whitened with the frosts of seventy-six winters and protested that there was no legal way of convicting a witch, even according to the laws and beliefs of those times. It required no small amount of courage for him to take the stand he did against the opinions of the highest judicial tribunal in the province when no one was safe from the charge of having ddealings with the evil one, and he himself might be the very next one accused of being a witch! But having the courage of his convictions he rose to the demands of the situation and proclaimed his opposition by a formal and thorough exposition: The great merit of this position, so far as it has come down to us, belongs entirely to him, and no man of his time is entitled to greater honor. It is a marvel how he breasted the storm when any resistance to the popular demamd was deemed evidence of complicity with the witches, imps and all the powers of darkness, to overthrow the true church on earth. He defended and plead the cause of several of the accused, among whom were Mrs. Mary Bradbury (daughter of John PERKINS), who was condemned but not executed, and Susanna Martin (wife of George MARTIN), whose memory is perpetuated by John Greenleaf Whittier, the poet. “Major Robert Pike–in pursuance of your commission, given you by the Governor and General Court, to be commander-in-chief of all the forces detached or to be detached out of the militia belonging to this colony of the Massachusetts, posted in the provinces of New Hampshire and Maine and such others as shall be put under your command. . . . You are diligently to intend the defence and preservation of the lives and estates of their Majesties’ subjects, and to repel the force of the enemy. “You are to take all care to inform yourself of the seat, state and number of the enemy, and to improve your soldiers to pursue, prosecute, kill, and destroy them as you shall have opportunity, wheresoever they may be found.” . . . (signed) SIMON BRADSTREET, Governor. May 1, 1691, he was at Wells, Me., and at the old garrison house of Lt. Joseph Storer made treaty with the Indian chiefs, Jonathan Remington, Wesombonet, William Partridge, Nonunkte, Tentomegan, Samson Hegan, Kenowonit, Rob Dony, Old Dony, and Sabadis. He was on the Governor’s Council many years ending his public career in 1696, when he resigned and devoted the last ten years of his life to disposing of his valuable property among his children. 1653 – George MARTIN and Theophilus SHATSWELL were two of the fifteen “humble immortals” who, in 1653, stoutly and successfully maintained for the first time the right of petition for the subjects of the English crown. Lt. Robert Pike, of Salisbury, an influential citizen, had denounced a law passed by the General Court, for which he was convicted, fined and disfranchised by the General Court. Lt. Pike, a prominent town official and later a member of the General Court, denounced the law forbidding to preach if not Ordained. Which law was aimed at Joseph PEASLEE and Thomas Macy, believers in the Baptist Doctrine, with Quaker tendencies. The autocratic General Court resented this and Lieutenant Pike was fined over thirteen pounds and bound to good behavior. This punishment caused many citizens of Salisbury and the surrounding towns to petition for a revocation of the sentence. This offended the Court still more, and the signers were called upon to give “a reason for their unjust request”. Out of the seventy-five who signed, the above mentioned fifteen alone refused to recede or apologize, and they were required to give bonds and to “answer for their offense before the County Court”. Their cases were never called to trial, and they thus, by their firm stand, laid the foundation for these rights, which are now granted in all the civilized world. Later this gift of preaching made trouble in the new settlement and history for Joseph. Soon after he removed to “Newtown,” the inhabitants neglected to attend the meetings for worship in the old town and did not contribute to the support of the minister. They held meetings for-worship at private houses, and in the absence of a minister, Joseph Peaslee and Thomas Macy officiated.The general court, which had jurisdiction over territory from Salem, Massachusetts, to Portsmouth, New Hampshire (was called Norfolk county), soon fined the inhabitants of “Newtown” five shillings each for every neglect of attending meetings in the old town and an additional fine of five shillings each to Joseph and Macy if they exhorted the people in the absence of a minister. This decree was not heeded. Meetings were held and Joseph and his friend continued to preach. The general court made additional decrees and fines, which also were not heeded. Mary’s husband Andrew Greeley was born about 1620 in England. 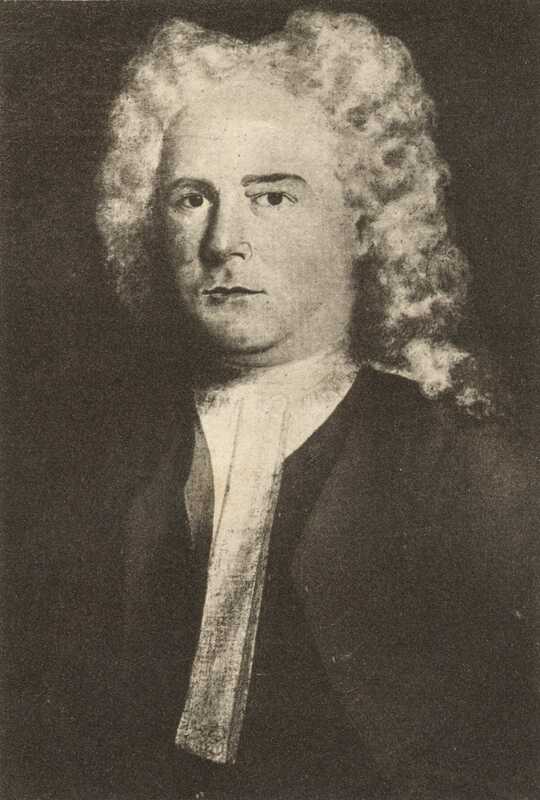 Andrew died 30 Jun 1697, Salisbury, Essex, Mass. Andrew’s name appears on the Salisbury records first in 1640, but he was probably settled there some time before that date. He was a miller and settled in the part which is now included in Seabrook, New Hampshire and built his mill on Kane’s river, to grind corn. About 1650 he added a saw mill, and soon after the completion of the mill he moved to Haverhill, Massachusetts. He was constable of Salisbury in 1653, and was a member of the planting and prudential committee. He was often on committes to lay out land and settle boundary lines, and was appointed to seal leather in 1677. In 1655 he entered into an agreement with Bartholomew Heath to maintain a corn mill for the inhabitants of Haverhill. In 1669 he was chosen to keep the ferry at Haverhill. He went bonds for his son Benjamin who died and left his debts unpaid, and the father was obliged to sell his house and property in Haverhill in order to pay them, returning to Salisbury, where he lived with his son Andrew on the old homestead until his death. This entry was posted in 13th Generation, Immigrant - England, Line - Miller and tagged Salisbury Pioneer. Bookmark the permalink. your (sic) an xxxxx, how could Joseph, born in 1600 be the son of ann calvert and william peasley when they were born about the same time. impossible. do the math joseph peasley is not a Calvert.